As a group, The Crusaders have had an on-again, off-again career that stretches back to the early 1950’s. Although the quality of their recordings have varied, the group has managed to maintain a following. Billed as their first new recording in 20 years, “Rural Renewal” (Verve, 2003) was for many a welcome addition to the group’s oeuvre. Original band members Joe Sample (keyboards), Stix Hooper (drums) and Wilton Felder (tenor sax) are joined here by special guests Ray Parker, Jr. (guitar on tracks 1-7 and 9) and Eric Clapton (guitar, tracks 1 & 2). The addition of rock/blues legend Clapton on a jazz disc might have surprised some, but should not have. Only a few years before “Rural Renewal” was recorded, Clapton and Sample toured Europe’s summer jazz festival circuit along with bassist Marcus Miller, saxophonist David Sanborn and drummer Steve Gadd under the group name “Legends”. The album opens with two Joe Sample originals, “Rural Renewal” and “Creepin'”. Each begins with Sample on the keyboard, and he is joined almost immediately by Clapton and Washington. These are a brace of pleasing tunes that, while not exactly hard-driving, still manage to engage your attention. Both songs have a funky feel to them that made me want to close my eyes and crank the volume UP. Luckily for me, I have a great set of headphones so I can indulge in that type of behavior without alienating my neighbors, not all of whom likes jazz. Track three, “Heartland”, was written by Wilton Felder and George Shaw and is a livelier piece that moves along nicely while showcasing Felder and Baxter’s horns. At about two minutes and thirty seven seconds in the horns fall silent and we are treated to Sample on what certainly sounds like an acoustic piano, backed by Hooper and Castro on drums and percussion respectively. A bit over a minute later Felder’s sax returns and the drums and percussion pick up the pace. “Heartland” is second only to “Creepin'” as my favorite on this album. “A Healing Coming On” is next. Written by Joe Sample and Will Jennings, this is an attempt at self-fulfilling prophecy which, alas, has yet to come true for many. Donnie McClurkin’s vocal rendition is too reminiscent of a Sunday-go-to-church gospel extravaganza for my liking. That obviously was Sample’s intent for this post-9-11 cry for help, so believers will probably like it. To a died-in-the-wool atheist like myself, however, it would seem that a competent songwriter could have achieved the same effect without the not-so-subtle reference to church. “Greasy Spoon” is a funky little Stix Hooper composition, and it features some great work by the entire ensemble. Portions are reminiscent of Three Dog Night’s hit from 1970, Randy Newman’s “Momma Told Me (Not To Come”. “Viva de Funk” and “Lazy Sundays” are the final two Sample originals on the disk. They are followed by “Goin’ Home”, another Wilton Felder/George Shaw piece. Despite my personal reservations about “A Healing Coming On”, I love “Rural Renewal” and I think it’s an excellent album. 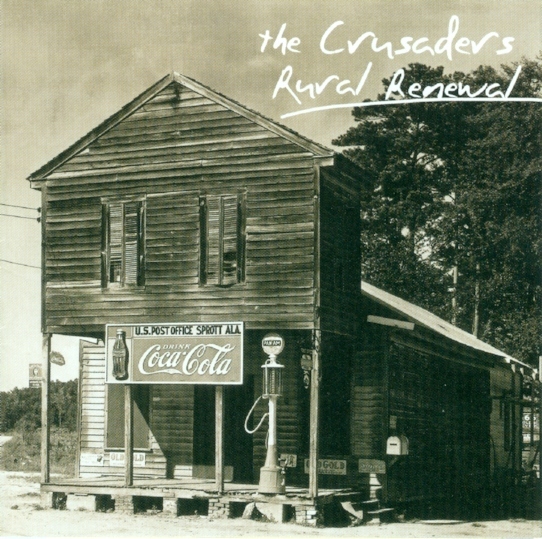 Let me say that again so there is no misunderstanding: I think “Rural Renewal” is an excellent album. All too often when a once-popular group returns after having faded from view for a few years (or decades, as the case may be), their reunion work turns out to be a sort of musical in-joke that appeals to die-hard uber-fanboys who are still living in the past, an no one else. That is not the case here. Before you buy the whole album, buy a track or two online at your favorite legal music download site. My recommendation would be “Creepin'” or “Shotgun House Groove”. If you like them, and I believe you will, then you’ll love the rest of the album.